One of the main reasons that golf in Thailand is so popular for golf tours is because almost everywhere you go you will find a golf course on your doorstep. Thailand also offers tremendous variety from the mountains and hill tribes in the north around Chiang Mai and Chiang Rai to the wild nightlife of Pattaya and the rather quieter white sand beaches in Hua Hin. If you don’t want to venture too far then the capital city of Bangkok with more than 50 golf courses within easy reach and many top class entertainment venues is a great place to start. Thailand’s premier beach resort is Phuket in the south with plenty on offer both on and off the golf course. Koh Samui off the south east coast is a wonderful beach resort and although it only has one golf course, it is superb. If you prefer something a little more unusual than you could try the jungles of Khao Yai about 2 hours north of Bangkok which boasts more than 10 golf courses and some of them have great places to stay as well. Another place you could experience if you’ve already been everywhere is Kanchanaburi which also has several great golf courses and you can also take a look at the infamous bridge over the River Kwai. What sets Thailand apart from other golfing destinations is the incredible range of hotels and resorts to suit every budget, with golf courses for the single handicapper as well as the weekend hacker. Getting around is easy as well and you can get to Pattaya in about 90 minutes by road from Bangkok. Hua Hin is a bit further away on the other side of the Gulf of Thailand but can be reached in about three and a half hours. If you have decided to head north and you can travel to Chiang Mai and Chiang Rai by air in 1 hour and to the beach resorts of Phuket and Koh Samui in the same time. When you travel on a golf tour in Thailand you will be met on arrival at the airport and whisked off to your hotel by luxury car or minivan where you can expect a warm welcome whatever a standard of hotel you have chosen. You will be picked up from your hotel and driven to the golf course in time to hit a few balls before you set off on your round. We will leave you time to relax after your round and have a few beers or a meal before you head back to your hotel for a swim or relax before heading out for the night. If you want to take a day off from golf or you have a non-playing partner, then there are plenty of other things to do apart from playing golf and we can help you to organize this. "Bangkok has a more than 30 golf courses within 60 minutes of the city center"
Bangkok has a great selection of top class golf courses with more than 30 courses within 1 hour of downtown and many a lot closer. We recommend that you stay in the Sukhumvit area which gives you an easy access to all the main entertainment areas using the local train or BTS which runs the entire length of Sukhumvit road. If you prefer something a little quieter, then stay along the river and you can catch a boat shuttle to and from your hotel to the nearest BTS station. If you don’t want to venture too far from town then there are several courses which can be reached in under 40 minutes from the centre of Bangkok. These include Thana City, Summit Windmill which also has a top-class accommodation on site, the Royal Golf and Country Club which is very close to the Airport or you could try Muang Kaew or the nearby Lakewood Golf Club. If you want to play the best courses then be prepared to travel a little further out of town. Thai Country Club and which is one of the best courses in Thailand can be reached in little over an hour and Alpine Golf and Country Club and Royal Gems Golf City are both about 60 minutes north of the city. Nikanti, which is the latest course to open in Bangkok is getting rave reviews but it takes about 90 minutes to get there. Navatanee which is the grand old lady of golf in Bangkok is a little closer to town. Golf courses in Bangkok get very busy at weekends and they also increase the prices so we recommend that if you have a choice that you play midweek. If you do this, then not only will you save a lot of money but you’ll also have the course to yourself. "There are more golf courses in and around Pattaya than any other golf resort in Thailand"
If you are going direct from Suvanabhumi International Airport to Pattaya it will take no more than a 75 minutes along the 6-lane highway. If you are starting from the centre of Bangkok, then it will add 30 minutes to your journey time. There are more golf courses in and around Pattaya than any other golf resort in Thailand. 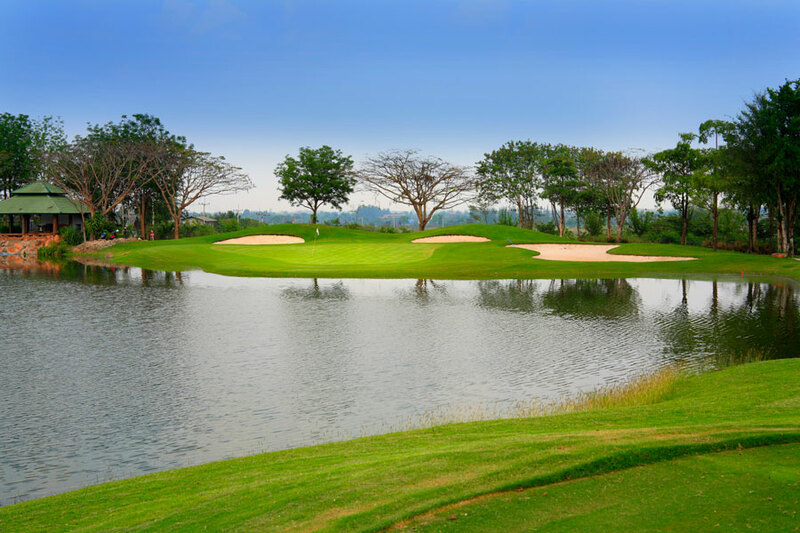 Pattaya also boasts a great selection of courses including the three golf courses at Siam Country Club and the Jack Nicklaus designed 27-hole course at Laem Chabang Country Club. But you don’t have to spend a lot of money playing golf in Pattaya because there are plenty of much cheaper and very viable courses on offer including Burapha, Khao Kheow, Pattaya Country Club, St Andrews 2000, Phoenix Gold and many others. Nearly all of the golf courses in Pattaya can be reached inside 40 minutes wherever you stay. Pattaya has expanded rapidly and there are literally hundreds of places to stay, from the iconic Royal Cliff Beach Hotel which sits alone on a headland north of the city to the 3-star Sabai Resort & Sabai Lodge with its laid-back atmosphere – a very popular venue with golfers. Most of the nightlife is centred around Walking Street in South Pattaya so if you’re looking for something quieter then we recommend you stay in North Pattaya. Getting around in Pattaya is very easy and you can jump on and off the local Tuk-Tuks for just a few pennies and they run all day and night. Pattaya also gets very busy at weekends as it’s so close to Bangkok and most golf courses up their rates on Saturday and Sunday so it’s much better to play midweek. "Hua Hin is home to two of the best golf courses in Thailand"
As the crow flies Hua Hin is not that far from Pattaya but it’s located on the other side of the Gulf of Siam around two and half hours’ drive from Bangkok, depending on the traffic. The king maintains a royal palace here so out of respect for the royal family they have not allowed the type of nightlife you find in Pattaya to develop in Hua Hin. There are plenty of bars and restaurants to enjoy but not so “in your face” as Pattaya. Hua Hin has a much nicer beach with miles of white sand on offer and plenty of beach activities. But you didn’t, come here to sit on the beach but to play golf and there are some great golfing options in Hua Hin. 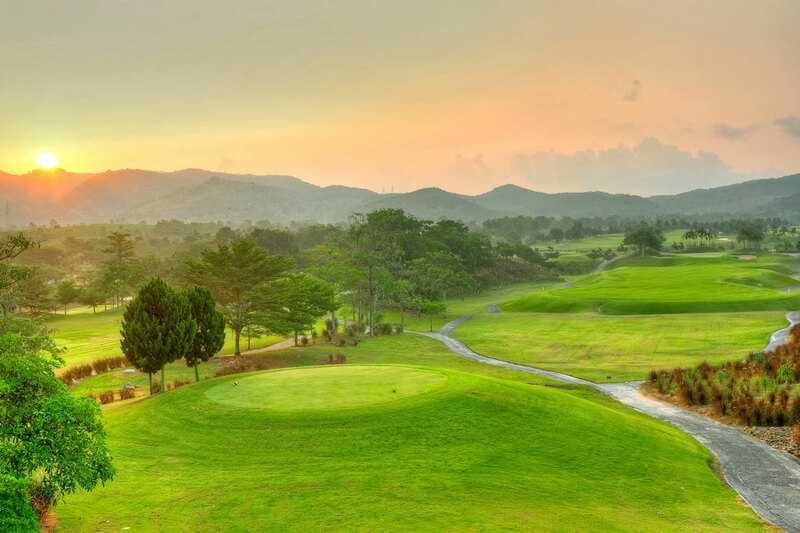 Hua Hin is home to two of the best golf courses in Thailand: Black Mountain is probably the most high-profile course in Thailand as it has hosted a number of international events. It’s in immaculate condition but can get very crowded, especially at weekends and during the high season. They are about to open another nine holes so hopefully that will ease the congestion. The Banyan Golf Club is another top class layout with some great views towards the mountains of Burma and from some of the holes you will get a glimpse of the sea. Jack Nicklaus left his mark in Hua Hin in the shape of Springfield Golf & Country Club which is an excellent 27-hole layout about 40 minutes from downtown. There is one golf course which runs close to the sea and that is Sea Pines – this is another excellent golf course which is let down by poor management. 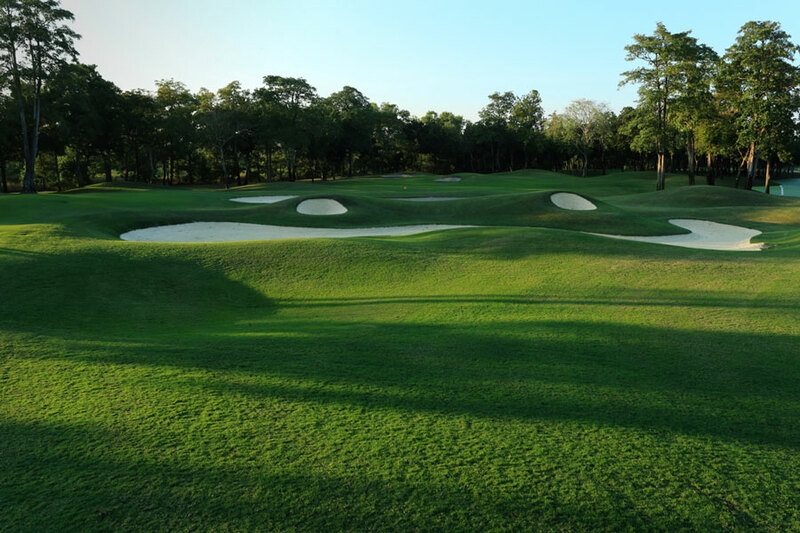 If you would like to try a piece of golfing history then you should play Royal Hua Hin Golf Club which was the first golf club to open in Thailand. It’s seen better days but it’s very convenient location in the centre of town makes it an excellent option. Another golf course which is making a name for itself is Majestic Creek following a major renovation a couple of years ago. You need to be careful when choosing where to stay as the beach resorts of Cha-Am, Hua Hin and Pranburi are located along a 40 km stretch of beach. Most hotels claim to be in Hua Hin but if you’re not careful than you can end up 20 to 30 minutes outside the centre. "There are some great golf courses in Phuket including possibly the best golf course in Thailand"
Phuket is in a very central location about 1 hour from Bangkok, 1.5 hours from Singapore and 4 hours from Hong Kong. There are only seven golf courses in Phuket and most of them are located in the northern half of the island so you should take this into consideration when choosing where to stay as there are numerous different beaches in Phuket. Patong Beach is the most popular beach for golfers as it’s the centre of all the nightlife and within easy reach of most of the golf courses. If you want something quieter then we recommend you stay in Kamala, Surin or Bangtao which are all a bit closer to the golf courses and also have better beaches. There are some newer beach areas in the north of the island close to the airport which are becoming more popular and these include Mai Khao and Naithon. There are some great golf courses in Phuket including possibly the best golf course in all of Thailand. Red Mountain Golf Club is a spectacular layout built in the red hills not far from Patong with wonderful views and some really spectacular holes. Not far from Red Mountain you’ll find its sister course Loch Palm and nearby is Phuket Country Club, still popular with local golfers and for those on a budget. In the north of the island, not far from the airport, are the two courses at Blue Canyon Country Club that once hosted the Johnnie Walker Classic won by Tiger Woods. Another course nearby is the Jack Nicklaus designed Mission Hills Phuket which has some spectacular holes beside the ocean offering great views of the surrounding islands. Phuket offers plenty of options when you are not on the golf course and if you have time we recommend that you visit some of the outlying islands. "The main attraction of Chiang Mai for golfers is the cooler weather"
The main attraction of Chiang Mai for golfers is the cooler weather and during the winter season temperatures can drop to near zero on top of the mountains and if you tee off early in the morning you may need a light sweater until the sun gets up. 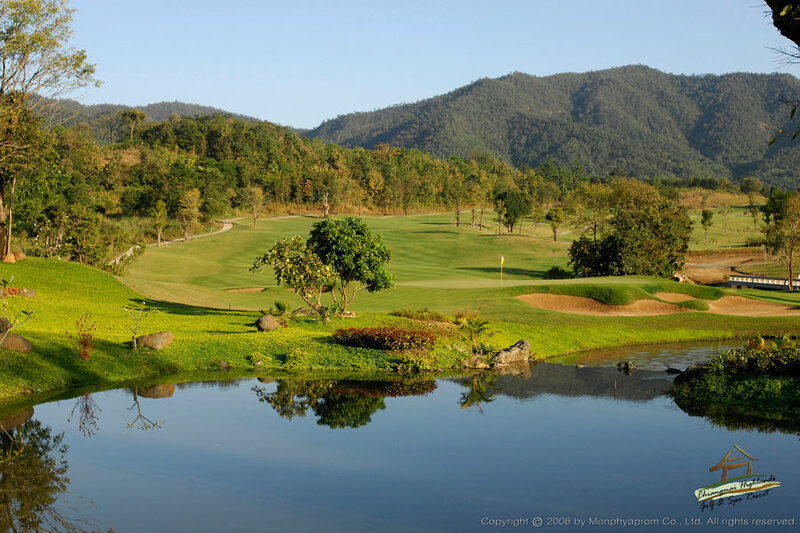 Chiang Mai is also home to some of the best golf courses in Thailand including Chiang Mai Highlands and the Alpine Golf Resort both of which are set in the rolling hills characteristic of Chiang Mai and offer a great golfing challenge. The Gassan Group have recently renovated two of their golf courses and have started work on the third. Mae Jo Golf Club which is built on the site of a former orchard is a very popular course with some great views over the surrounding mountains from some of the tee boxes. 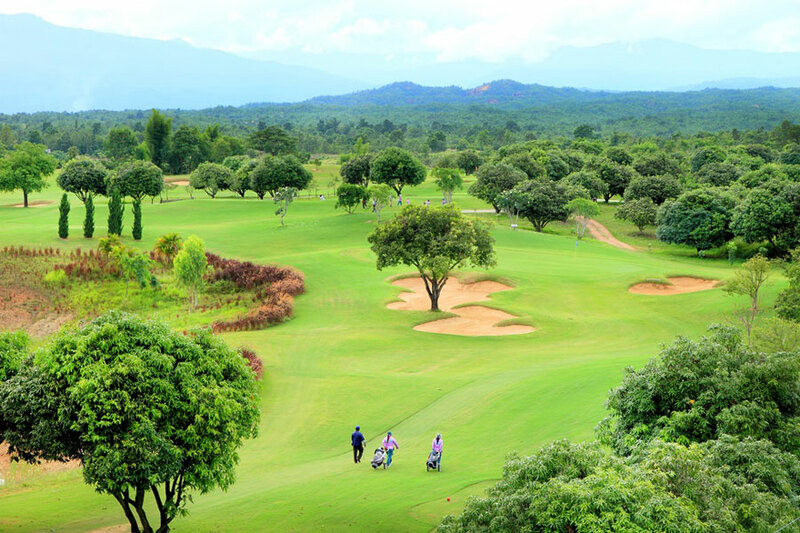 One of the older golf courses in Chiang Mai is the Royal Chiang Mai Golf Club and we also recommend Summit Green Valley. About 2 hours north of Chiang Mai you reach Chiang Rai which is very close to the border with Burma and the Golden Triangle. Only three golf courses here but one of them is exceptional and Santiburi Chiang Mai ranks with the best in Thailand. If you’re visiting this part of Thailand then you should definitely take a couple of days off from golf and take time to visit some of the hill tribe villages where their way of life has changed little over the years. "There is only one golf course in Samui but it’s a very special one"
Koh Samui is a relatively small island of Thailand off the southeast coast which can be reached by direct flights from Bangkok in around one hour or by ferry from the mainland. Samui is much quieter than Phuket so if you are looking to escape and relax on the beach with the odd game of golf then Samui is a great choice. There is however only one golf course in Samui but it’s a very special one set in the mountains overlooking the islands. 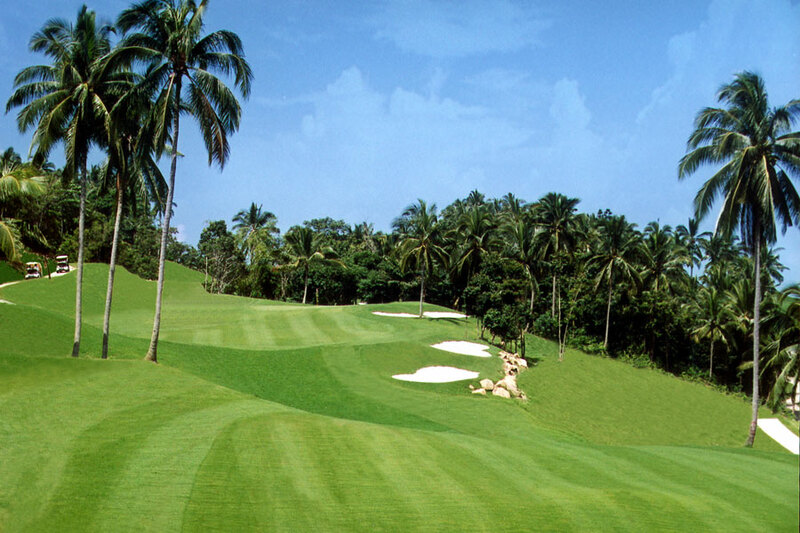 Santiburi Samui is rated one of the most difficult in Thailand, especially the back nine. But don’t worry about your score – just enjoy view. "There are some really spectacular golf courses here"
Khao Yai is the largest national park in Thailand about 2 hours’ drive north of Bangkok and is a great place to escape for the weekend. There are some really spectacular golf courses here and the one thing that they all have in common is the wonderful natural jungle setting. Most of the golf courses have on-site accommodation and the pick of these is Kirimaya Golf Resort which also has a Jack Nicklaus designed golf course within the resort. 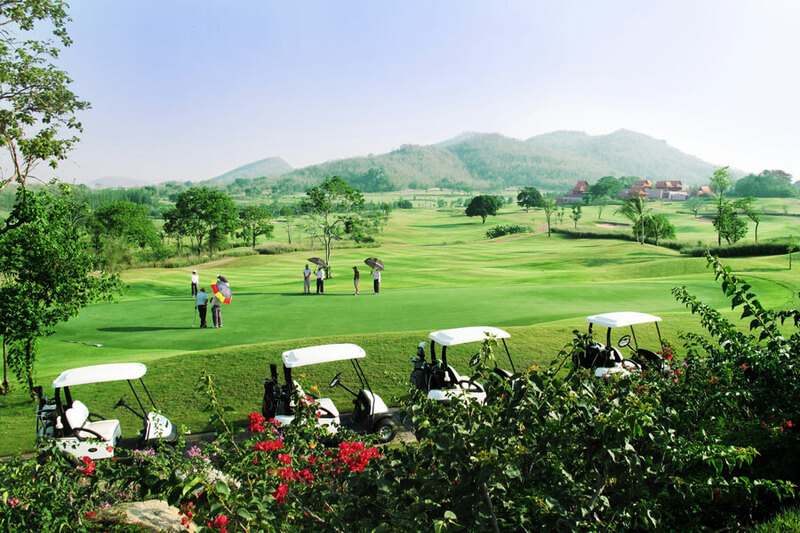 Other popular golf courses in Khao Yai include Bonanza Golf Country Club, Mountain Creek Golf Resort, Sir James Resort and Toscana Golf & Country Club. Kanchanaburi is most famous for the Bridge on the River Kwai but it is also popular with golfers looking for something different. It’s about 2 hours’ drive from Bangkok and it is also quite accessible from Hua Hin which makes for an interesting two centre holiday. We now hope that you have a better idea of the options available when planning a golf holiday in Thailand and remember wherever you decide to go you’ll be greeted by smiling Thai caddies that make golfing in Thailand so unique.